What wrought iron end table types do you offer? Where might I want to use wrought iron end tables? The living room or family room is a traditional place to use end tables - At the end of or on either side of a sofa or love seat, as well as near other seating. In the bedroom, end tables work well at the bedside, in a sitting area or near a chaise or lounge chair. In the master or guest bath a chair with a small table beside it can add comfort and a look of luxury. What materials are used to create your wrought iron end tables? What are the most popular shapes and sizes among your wrought iron end tables? We offer round, square and rectangular end table designs. Our round tables range from 241/2" to 28" in diameter. Square tables are 15 1/2" x 15 1/2" to 24" x 24". End tables with a rectangular shape go from 24" x 18" to 24" x 28". You'll find many other sizes in between these approximations. Height - an end table should be approximately the same height as the arms of the sofa or chair or just below that level. Too low or too high and reaching for a glass or magazine on the table can be problematic. For an armless sofa or chair aim for a height that falls where an imaginary arm might be. Size - here's no hard and fast rule as to the length and wide for an end table. It's easy see if a table fits your space. Perhaps Goldilocks knew best - not too small, not too big, but a size that's just right. An ideal table will fit perfectly beside the sofa or chair that will be its companion. Number - From one to several tables will work in the average room. For someone who has a large family or entertains a lot, the number of end tables should be selected for convenience without overwhelming the space or making it seem overcrowded. Learn more about end tables from these articles written by expert designers. 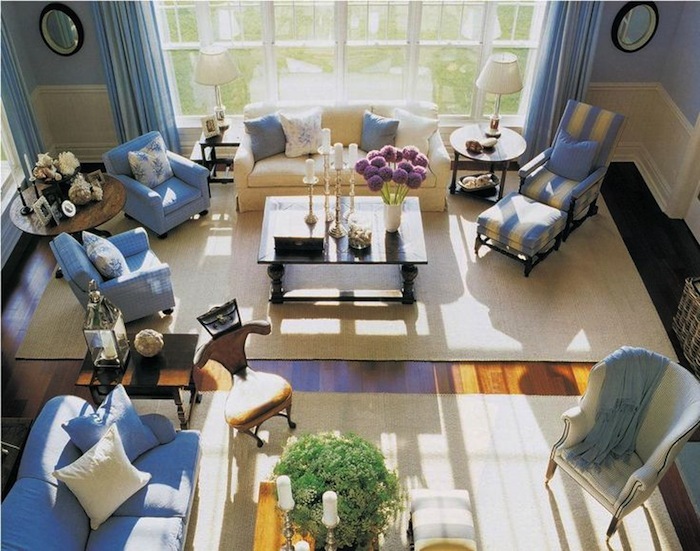 The Ultimate Decorators� Guide to Ideal Living Room Layout Measurement. Apartment Therapy offers a no-nonsense guide to furniture sizes and heights, distance between pieces and space around them. From the height of the coffee table versus the sofa to the distance from side tables to chairs, this is a guide you'll want to reference often. "End Tables in the Living Room & Beyond." Want to add new tables to your home? You'll see lots of ideas for adding interesting end tables to your decor in this detailed article. "End Tables in the Bedroom"
Getting ready to update your master or guest bedroom? Here you will find ideas for using end tables in all sorts of styles. "How to Place Side Tables"
The Nest offers a short and sweet article about the placement of side tables. Lots of info packed in here. "The Right Height of a Table Lamp for Your End Table"
Longer and more detailed, Fred Gonsowski of Garden Home blog gives extensive information about the height of end tables and lamps. This is a fun read.